Create a sleek yet functional place for your TV with this TV Stand. This piece includes three top open shelves and two large drawers below, perfect for storing your media components and DVDs. This piece features a beautiful cappuccino finish, stunning metal drawer pulls, and bracket feet. This piece holds up to a 60" TV and 220 pounds. Use this stand alone or as part of a complete wall unit, with two media towers and a bridge. 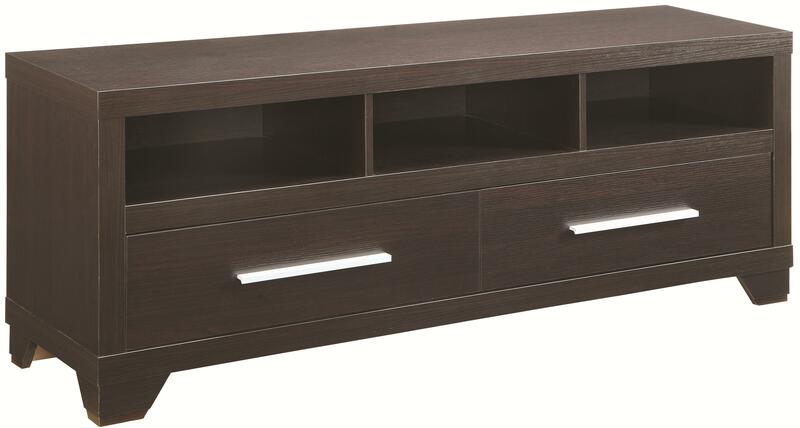 The Entertainment Units TV Stand with 3 Shelves and 2 Doors by Coaster from Nashco Furniture - Nashville. We proudly serve the Nashville, Franklin, Brentwood, Clarksville, Green Hills, Davidson County, Williamson County, Tennessee area. Product availability may vary. Contact us for the most current availability on this product. The Entertainment Units collection is a great option if you are looking for furniture in the Nashville, Franklin, Brentwood, Clarksville, Green Hills, Davidson County, Williamson County, Tennessee area. Browse other items in the Entertainment Units collection from Nashco Furniture - Nashville in the Nashville, Franklin, Brentwood, Clarksville, Green Hills, Davidson County, Williamson County, Tennessee area.